January makes three months that I’ve consistently tracked my expenses. I relaxed for awhile and wasn’t tracking as religiously as I had been for most of last year. This is mostly due to having a good “feel” for where the money is going and knowing that I’m not spending large sums in any one area. I don’t follow a budget, for me there is an intuitive sense of where my money is going. The only revelation over the three months has been my spending on food, which continues to run higher than I would like and January was no exception. So, what’s the point of sharing these updates? Mostly to give me a way of keeping track of things that I’m working on. There’s been a slow “revolution” of sorts in the way I relate to money, questioning the very notion of the idea of money being the only means to attain the things I need and want. It’s not a common view that I take and not one you simply pick up one day and decide it will fit your life. It’s part of a broader philosophy of living, with money being a very small part of that philosophy, that I have slowly developed over the last few years and it’s continuing to evolve. The main difference here is that I dropped my cell phone plan through Republic Wireless. I was using Republic for about two years after reading the review that Mr. Money Mustache wrote. Overall I was happy with the service, but then the phone just started acting up. It would shutdown, freeze up, the screen wouldn’t register my touch, and host of other things. I’m not attached to my cell phone and it was an easy choice to drop the service rather than shelling out a few hundred dollars for another that’s going to last less than two years. No thank you. I have a work cell and can use Google Voice for a personal number. Internet went up because I added Netflix to the regular $14.99 internet service. Starting in Feb. my health insurance plan will kick in and I will start making the payments for it. I had considered not listing it here, but Dividend Mantra made a case in my last spending post as to why I should count it in my monthly spending and I have to agree that he is right. 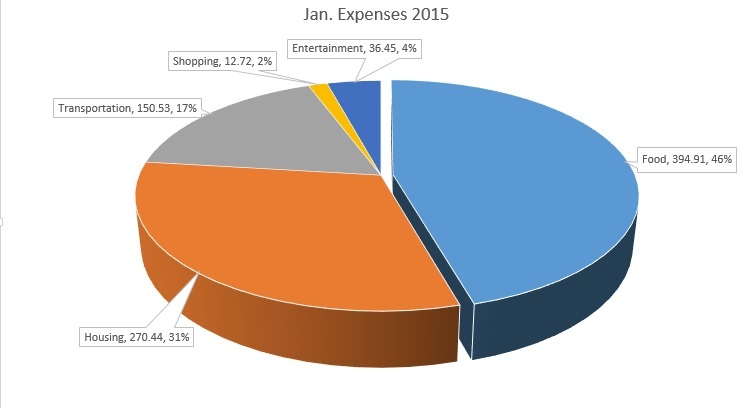 As you can see in the chart above, my spending can be broken down in to five main categories this month and once again food makes up the biggest expense. The Stoic loves to eat! What can I say? Food includes eating out, groceries, and alcohol. I do want to reduce the spending in this category for February and I’m going to make a greater effort to lower it going forward. How my gardening efforts and preserving turn out will play a big role. It should be interesting to see what can be achieved. One thing is for certain, I have plenty of room for improvement in the food department. When we took a 40% family pay cut, we slashed spending in every category. One of the most consistent savings we realized was buying groceries from a discount grocer. Those ugly shelves filled with original shipping boxes cutout to show the stock inside isn’t a friendly environment, but it saves us $30/week every week. Good luck! Thanks for stopping by! That’s a great tip and one I should look into. Where I shop now is more convenience, but it might be worth considering other options. Thanks for the tip and all the best to you as well. You should TOTALLY start a garden. I’m posting my gardening 101 posts later this week. We’ve been doing a serious garden for two years now (this year will be our third) and it is AMAZING. Not just from a money saving standpoint, but from a freedom standpoint. It’s so nice knowing we don’t need the grocer as much anymore. We did spaghetti sauce and tomato sauce for the first time last year. We do an amazing Chipotle Salsa, and dill pickles, of course. Oh, and some great jams. Most everything else we freeze. I’m still pulling carrots out of the freezer for pot roast, and I think we’ve got some green beans, diced green pepper, and diced onion left too. Can’t wait to read it Laurie! I’ve actually been going over the gardening/preserving posts on your blog. Great information. I don’t think food is the best category to cut back on. Eating well and healthy should be a top priority. Whenever I don’t have a good meal I get all grumpy, which impacts my productivity and (inevitably) my income. Thanks for stopping by! I agree with you on the importance of eating well. I’m almost forty and I have no intention of starting to eat Ramen or peanut butter and jelly sandwiches as stables of my diet. 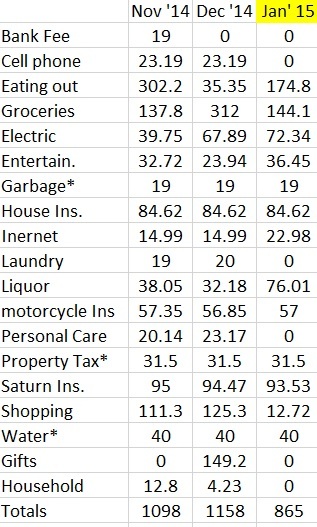 Since I count eating out, groceries and alcohol in my food category, I do see improvement in the eating out and alcohol areas of my spending and that is where I will likely start cutting. I’ve managed to do fairly well for the month of Feb. so far. We’ll see how it ends.